Report Automation tutorial is designed to give you an overview of report automation, and to touch on some high level concepts such as running the Automation Wizard, configuring automation options, and scheduling a task to run using Windows Scheduler. Let’s say you have created a beautiful report with Analytics Canvas. You have reused the underlying template for different clients, time and time again. If you have to do this frequently, it may be best for you to automate the process. The Analytics Canvas Automation Wizard helps you build reports for your clients automatically – from simple spreadsheets to complex and attractive Excel reports. Start with the end goal in mind. What data transformation do you want to achieve? In this tutorial, we will use a website performance canvas to schedule monthly automation reports. You can find this report by clicking on the Show Examples button and selecting the “Single Website Monthly Performance”. template. To get started with automation, open the Automation Wizard by selecting Automation, and then Automation Wizard. The Automation Wizard window guides you through the generation of a batch file, that will be used to automate your canvases. The process consists of selecting canvases, providing credentials and generating batch files. Select Canvases – Sets one or more .ACC files and specifies the order in which to run them. Click on the Add Canvas button and locate one or more files that you would like to automate. Modify the order in which you would like to execute them, and click Next. In our case, it’ll be “www datamartist com-Single-Website-MonthlyPerformance.acc”. Note: All the files required for the automation must be located in the same folder, including the log folder, batch files and credentials files. Provide Credentials – Authorizes Analytics Canvas to access the data that it will need to generate the report. We are using Google Analytics data. We’ve already authorized Analytics Canvas to connect to Google Analytics, when we created the canvas for this analysis. Note: Authorization tokens are stored on your machine. If, in future, you need to create reports for different Google Analytics profiles, you will need to create a batch file for each profile to schedule them to run in the same job. You can change the user account for which the batch file is generated, by selecting Accounts on the top ribbon. Generate Batch Files – Configures automation options, including email notifications, error handing and log files. You can set Analytics Canvas to send you a notification every time a report has been generated. You have the option of receiving an email when report generation fails, after each successful canvas run, or after all the canvases have run successfully. Error handling provides two options: “Stop” if a canvas fails, or “Run all Canvases” even if one of them fails. Here you can also consolidate log files into a single file, to avoid generating too many files, if you are running Analytics Canvas multiple times per day. Note: If you choose to be notified by email, you will need to configure the email server by providing host, port, email account, and password information. You can test the email server connection by sending a test email. Please note that all the passwords are saved on your machine and need to be guarded securely, as they are not encrypted. Finally click Save and Finish to save the batch file on your computer. To schedule the reports to be generated regularly, you can use Windows Scheduler. Your PC needs to be turned on during the time the report is generated. Most Windows machines have Windows Scheduler installed by default. You can also download it from the PC App Store. In Task Scheduler, click on “Create Basic Task Wizard”. This will take you through the process of creating a basic task, such as naming it, creating a trigger to start your task, and setting the action that you want the task to perform. Step 1: Provide a name and description of your task, and click Next. Step 2: Set when you want the task to start. You can set it to start daily, weekly, monthly, just one time, when the computer starts, when you log on, or when a specific event is logged. Click Next. Step 3: If you’ve decided to run the task daily, weekly, monthly or just the one time, Task Scheduler will prompt you to set the dates and time that you would like the task to start. Select the dates and click Next. 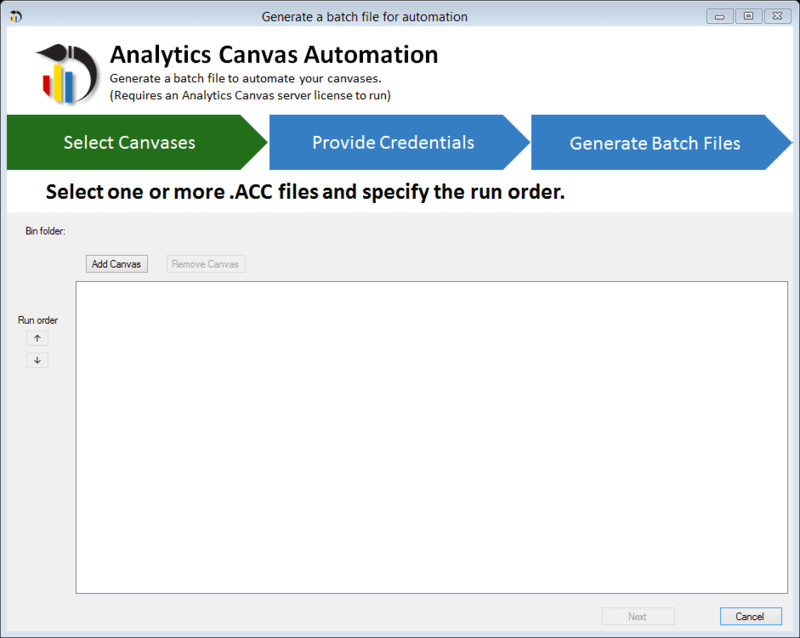 Step 4: In Action, select “Start a Program” and locate the batch file that you have just created with Analytics Canvas, and click Next. Step 5: Verify your task and click Finish. The new task will be added to your Windows schedule. We have successfully automated our monthly report! Thank you for reading this tutorial on report automation with Analytics Canvas. 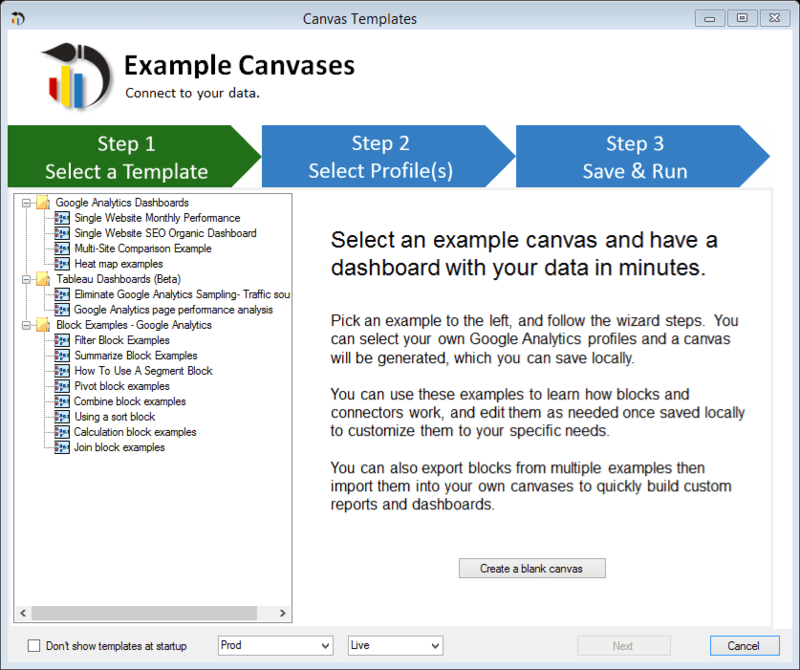 We invite you to continue with the tutorial training to learn more about using Analytics Canvas.